still have a winning formula. Tom Rowlands laughs at the suggestion that a Chemical Brothers live show is more akin to stadium clubbing than any underground alternative. But when he’s kicking back, pre-gig, on Pag Island—“the Ibiza of Croatia” he calls it—surrounded by a shimmering sea and a balmy clime, it’s difficult to deny that his stature has taken him well beyond the nightclub circuit. The perks of his success are so acute the ocean breeze practically wafts through the phone along with his mild British accent. 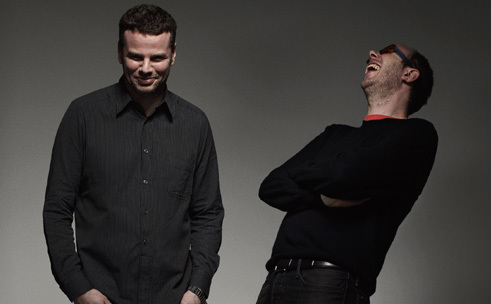 Creature comforts aside, the Chemical Brothers—which Rowlands formed with production partner Ed Simons in 1992—have drawn audiences in the thousands to their live shows for almost their entire career. The attendance wasn't far off when the duo headlined North Coast Music Festival at Union Park on Friday September 3. Pioneers of the first big wave of rave sounds exported from Europe and the U.K. in the ’90s, the Chemical Brothers were one of that period’s biggest success stories, rivaled only by Daft Punk and the Prodigy. Overseas, the Chem craze was even greater. Of their six albums prior to June’s Further, five have reached No. 1 in the U.K.
Grouped with Fatboy Slim and the Crystal Method as part of the big-beat movement, the Chemical Brothers’ sound is a blend of hip-hop, acid house, techno, pop and psychedelia—the product of a youth spent listening to Kraftwerk, Public Enemy and early club sounds emerging from Chicago and Detroit. It’s a formula that gives them the freedom to vary tempo, style and intensity at will, something many electronic acts lack. The malleable formula has also helped them maintain their 15-year career.